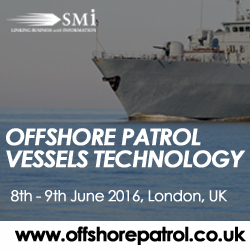 SMi Group Reports (2016.05.12, London, UK): Royal Norwegian Navy and Italian Navy confirmed speakers at Offshore Patrol Vessel Technology 2016 in London this June. In his presentation, Lieutenant Commander Hess will speak about his experience protecting Norwegian interests in the North Sea and Arctic Oceans, adopting flexible requirements for peace and wartime missions, overcoming the challenges of policing the Norwegian economic exclusive zone and utilising OPV technologies to maximize maritime environment protection. Commander Gardini will present on PPA OPV's bringing in new capabilities to the Italian Navy. Including; enhancing their ability to support operations abroad with cheaper and more flexible patrol vessels, the technical requirements for future Italian OPV designs and the ability of the PPA platform to deploy abroad in support of Maritime Constabulary missions. The expert speaker line up for 2016 also includes key decision makers from: US Africa Command, UK Border Force, French Navy, NATO, Italian Navy, Royal Norwegian Navy, Finnish Border Guard, TNO, Damen Shipyards, C-SIGMA and IISS. In addition, attendees will get the opportunity to hear from other senior technical and operational experts, and one of the world's biggest OPV designers and producers, for Maritime Defence and Law Enforcement organisations around the world, to share information and facilitate debate on how best to enhance OPV operations through advanced future technologies. Organisations who have confirmed their attendance include: OEM, Polaris Sensor Technologies, Inc, Weibel Scientific A/S, Insitu, Mabox Marine and many more. The 2-day event agenda focuses on new technologies available to OPV using nations across Europe and beyond, and includes briefings from leading Navy and Coast Guard officers from around the world. Event attendees will learn about current and future national OPV platforms and how they enhance maritime security, from the leading experts in the field. The programme also features interactive expert led panel discussions on international cooperation in operations and the future prospect for modular technologies. The event is proudly sponsored by Chess Dynamics and supported by: Seguranca Defesa, Port News, Homeland Security Research, The Nautical Institute, Marinetime Security Review, SAMI, Harbours Review, Armed Forces and many more.